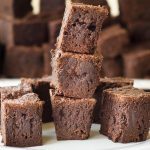 If there is one thing that gets requested more than any other dessert in my house, it’s got to be easy fudge brownies. Whether it’s this version with normal cocoa powder or the dark chocolate version they are always gone quickly. Good thing too; I like brownies. I know damn well I’m going to eat some brownies. I indulge…that’s why they are cut so small; so I can trick myself into thinking I’ve eaten three brownies when I’ve only eaten three bites. Cutting them small allowed me to put them on a skewer along with strawberries, blueberries, and marshmallow when I was asked to bring a dessert to a Memorial Day get-together. They mimic the colors of the American flag (for those readers who aren’t from around these here parts). 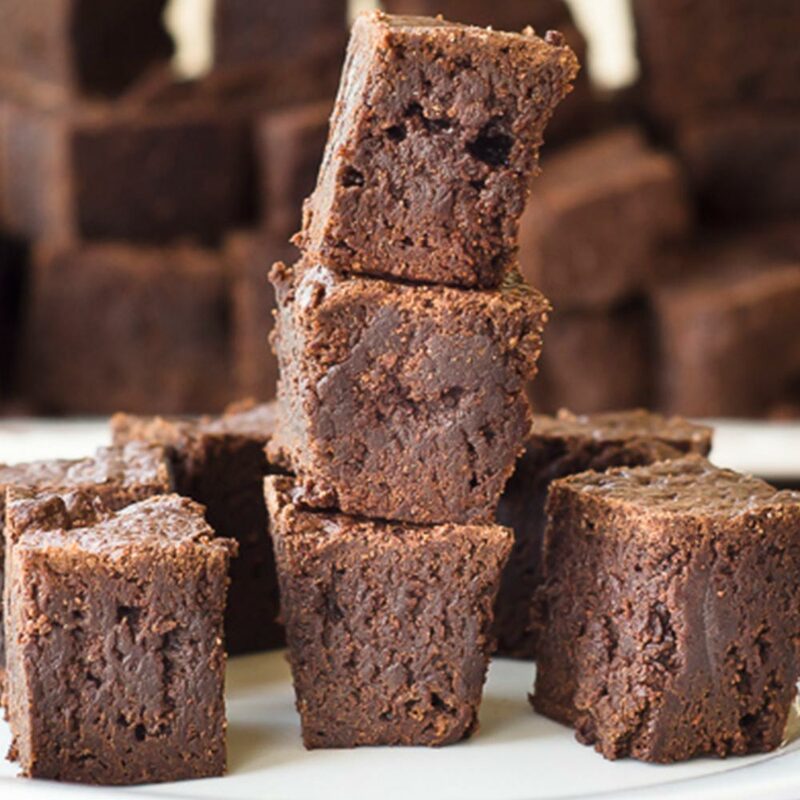 Overindulge and impress with these easy, super moist fudge brownies. Grease a 13x9 pan (I use a pyrex glass pan greased with butter). In a glass dish, melt the butter in the microwave for 1-2 minutes. Using a mixer, combine the melted butter, white sugar, brown sugar, and vanilla. Mix until creamy. In a separate bowl combine the dry ingredients: flour, cocoa powder, and salt. Sift using a wire whisk or sifter. On low speed, alternate adding in the eggs and dry mixture to the butter and sugar. Do not over mix. Place the brownie batter into the greased pan. Sprinkle the chocolate chips on top of the batter and, using a rubber spatula, gently press them down into the batter. Bake in the preheated oven for 50-55 minutes or until the top is slightly crispy. Allow them to cool before cutting.